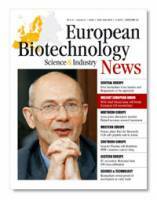 The English-language European Biotechnology Science & Industry News journal is directed at the decision-makers in science and industry of the unified Europe. The European market is a very promising, but partially still under-developed one that nevertheless offers exceptional opportunities for development and growth. The European Biotechnology Science & Industry News focus on a competent specialized readership in all 25 EU member states and Norway and Switzerland. The main focus is on the major biotech clusters, on renowned European research institutions, as well as members of national scientific and corporate associations and the biotechnology and Life Sciences industry sector. The highly promising information environment of this journal constitutes timely news from science and industry, background reports on new EU legislation, current debates and financing inititiatives from Brussels, as well as market analyses and previews on upcoming technology trends.